Since I finished writing this post a day early, I decided to go ahead and publish it. The market sank some yesterday after Russian troops reportedly entered southeastern Ukraine. The pathological liar Vlad and his lap dog Sergey Lavrov deny any Russian involvement in Eastern Ukraine. As I understand Putin's claim, putting just a little spin on it, those Russian troops, who are on vacation, were in route with their Russian military vehicles to Crimea for some fun in the sun. Unfortunately, there is no other land route to their vacation destination other than through Eastern Ukraine. Once fired upon they had no choice but to defend themselves. The government's estimate for second quarter GDP was revised up to 4.2% from the previous estimate of 4%. News Release: Gross Domestic Product The consensus estimate for the second revision was 3.8%. Real personal consumption expenditures rose 2.5%. The S&P/Experian Consumer Credit Default Composite Index is trending near its historic lows, as is the St. Louis Fed's Financial Stress Index. 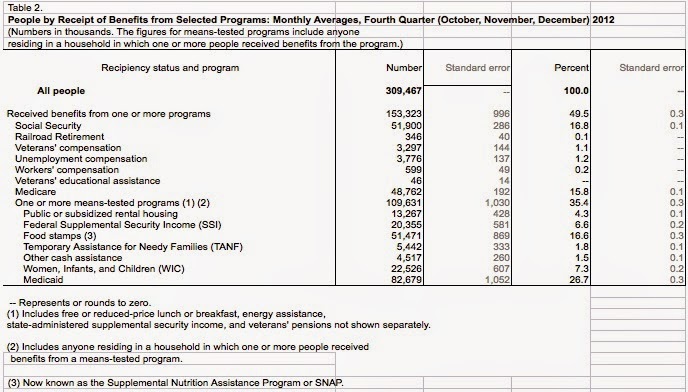 49.5% of the total households receive one or more program benefits which would include SS, Veteran's Care, Unemployment Compensation and Medicare. 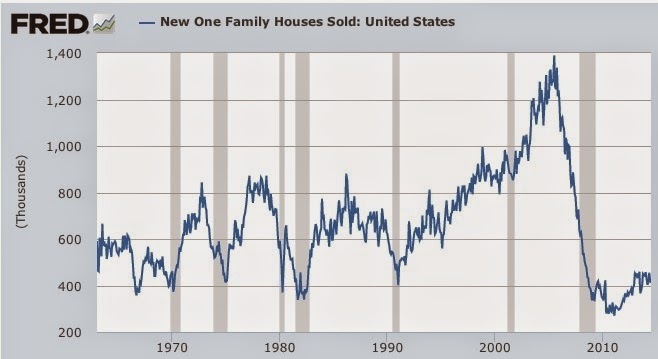 New single family home sales continue to trend near prior recession lows even though the last recession ended several years ago. Zillow reported that the negative equity rate "fell to 17 percent of all homeowners with a mortgage" which represents approximately 8.7M homeowners. 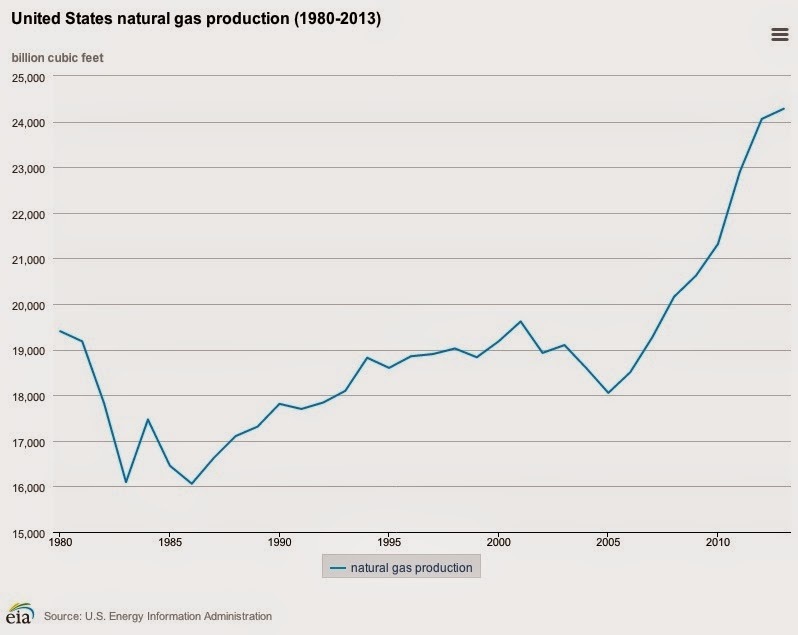 One long term secular force supporting a U.S. stock bull market is the move toward energy independence and an abundant supply of relatively low cost natural gas. Eurozone annual inflation fell to .3% in July. Euro area unemployment was steady at 11.5%. Eurostat Home Perhaps, the German austerity plan is not working out too well. There are certainly rumblings in several European countries to abandon that plan and to implement monetary fiscal stimulus. NYT There was a shake up in France's cabinet last week after the finance minister and other cabinet members criticized the austerity course. Those cabinet members are no longer in Hollande's administration. Bloomberg Hollande's approval rating was last reported at 17%. theguardian.com The European Central Bank is probably moving closer to some type of QE program. Consumers cut spending by a seasonally adjusted .1% in July. The savings rate rose to 5.7% from 5.4%. News Release: Personal Income and Outlays Real disposable income increased .1% in July, down from .3% in June. Personal savings in July (disposable personal income minus personal outlays) was $739.1 billion in July, up from $709.4B in June (i.e. a higher month-over-month savings rate). 1. Sold 100 IAE at $13.49 (see Disclaimer): I am going to gradually substitute the low cost ETF VEA, discussed in Item # 4 below, for IAE. I can trade VEA without incurring a commission in my Vanguard brokerage account which allows me to buy small lots cost effectively. Security Description: The Voya Asia Pacific High Dividend Equity Income Fund (IAE) is a buy-write stock CEF. According to CEFConnect, the last four quarterly dividends have not been supported by a return of capital but have been financed in part from short term capital gains. Rationale: The performance was poor. Over the past one year through 8/13/14, the total return based on net asset value was 12.46%. Over three years, the annualized total return was only 7.24%. Subsequent to my purchase, FAX went ex dividend for its monthly distribution on 8/20/14. Page 6 Aberdeen Asia-Pacific Income Fund, Inc. 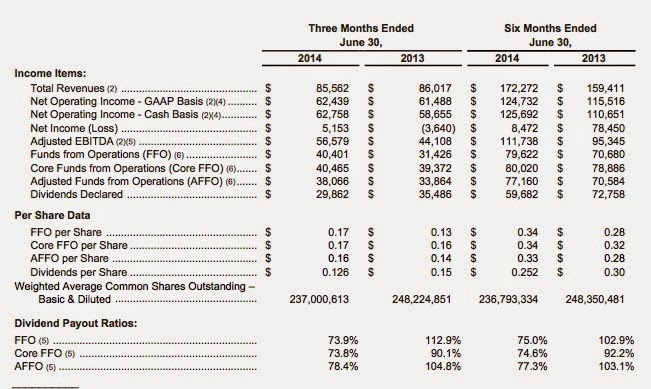 The current monthly distribution is $.035 per share. FAX Announces Record Date And Payment Date For Monthly Dividend Recently, that dividend has been supported in part by a ROC. Assuming a continuation of that penny rate, the dividend yield at a total cost of $6.11 is about 6.87%. The stock suffered from what I call a known CEF risk recently and last year, when the market price declined at a faster rate than the percentage decline in net asset value per share. The market price declined by 3% between 7/29 and 8/14, while the net asset value per share declined only by .58%. Although I do not know, I suspect that the slight decline in net asset value per share between those dates was due primarily or entirely to currency conversions. FAX is priced in USDs while it owns bonds priced in the currencies of several Asa-Pacific region countries. Prior Trades: I currently own a position in a taxable account. Item # 4 Added: 150 FAX at $5.8 (February 2014 Post); Item # 2 ought: 200 FAX at $6.08 (10/24/13 Post); Item # 6 Bought 100 FAX at $6.35 (6/15/13). I have quit reinvesting the dividend. 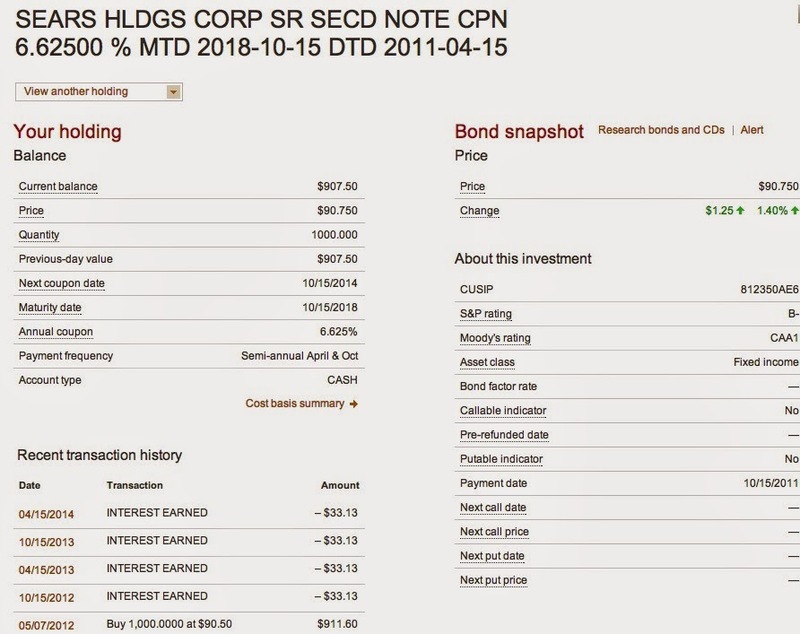 As noted in the last linked post, I was able to buy this bond fund at a greater than 30% discount to its net asset valuer per share during the Dark Period. I purchased 200 shares at $3.39 in October 2008 and quickly sold those shares for a $241.81 profit (see snapshot in Item # 6 Bought 100 FAX at $6.35 (Prior Trades Section); Some Nibbles Got Filled: JZE, PJS, INZ and FAX (October 10, 2008 Post). Rationale and Risks: The previous discussions, linked above, outlines the rationale and risks, so I will just highlight a couple of issues here. Currency risk is at the top of my worry list for this fund. The fund has exposure to bonds in several different currencies. I intend to sell within the next year my position in a taxable account. I am transitioning this security to ownership solely in the Roth IRA. In anticipation of that future transition, I started a position in the Roth with this 250 share purchase. FAX will own bonds, and consequently its dividends will not be classified of course as qualified dividends. I prefer to own bond CEFs in a Roth IRA, but will own several of them in taxable accounts periodically for their income generation. The goal for this security is to harvest dividends for a year or two and exit the position with a 5%+ gain in the shares after commissions. The objective is a 8% to 10% annualized total return, mostly provided by the dividend. 3. Bought 100 APTS at $8.75-Regular IRA (see Disclaimer): I thought that this REIT was a bit too risky for the IRA so I limited my purchase to only 100 shares and bought it in the Regular IRA. If the price declines by 10%+, I will consider transferring this stock to the Roth IRA or selling it for a loss. Security Description: Preferred Apartment Communities (APTS) is a relatively new REIT primarily focused on apartments with the intention of growing its retail assets to 20% of the total. The company recently announced to acquire nine grocery anchored retail shopping centers in Miami, Orlando, Atlanta and Columbus GA., Nashville and Houston "areas". Two of those centers, representing an aggregate 127,157 square feet, are in Nashville, and both of those are anchored by Publix. APTS is currently paying a quarterly dividend of $.16 per share. Preferred Apartment Communities, Inc. Announces Third Quarter 2014 Common Stock Dividend Assuming a continuation of that rate, the dividend yield at a total cost of $8.75 is about 7.31%. I left one mostly meaningless comment to a recent Seeking Alpha article on this REIT. I just wanted to point out that the apartment complex that APTs was acquiring in "Nashville" was in Gallatin, TN. Last Earnings Report: Due to the recently announced proposed acquisitions, the company as configured, prior to the closings of those acquisitions, is not that important or predictive of future results. Preferred Apartment Communities reported second quarter FFO of $4.091+M or $.25 per share. Normalized funds from operations was given at $.26 per share. AFFO was reported at $.21 per share. Same store rental revenues rose 4.3% during the quarter compared to the second quarter of 2013, while NOI increased by 6.99% on the same basis. The company discussed recent proposed acquisitions in this earnings press release. For apartments, the company is in the process of acquiring 1,397 apartment units in four geographic areas that it describes as Nashville, Kansas City, Dallas, and Houston. The total purchase price is $181.7M which is a huge bite for such a small REIT. That acquisition cost is higher than the current market cap. I noted in a comment to a recent SA article that it is a bit of a stretch to call the "Nashville" acquisition as being in Nashville. As I mentioned in my comment to the SA article reference above, this apartment complex is near Nashville and may be inside what some would call the greater Nashville metropolitan market, but the address is 2325 Nashville Pike, Gallatin, TN. 37066. (see article about this acquisition in Multi-Housing News Online) That complex has 364 apartments and is located on 30.5 acres. It looks nice. Rationale: Assuming this REIT can obtain favorable financing for these proposed purchases, and can earn an accretive cap rate after raising the necessary funds (partly through a stock offering), then some capital appreciation and dividend increases can be reasonably anticipated in the future. 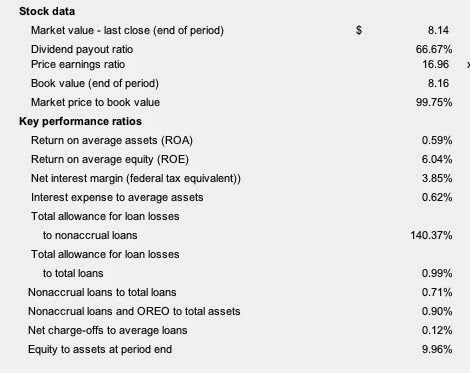 At the current quarterly rate, the dividend yield is about 7.31% at a total cost of $8.65. Risks: One substantial risk involves all of the recently announced acquisitions. Those acquisitions will more than double the REIT's size and will have to be financed successfully. Whenever a company grows this fast, there is always some danger that it will grow too fast or grow too much at the wrong time. Future Buys/Sells: I may average down in 50 shares lots, but I doubt that more than 50 more shares will be purchased in the IRA due to risk considerations. There could be a downdraft when APTS announces a share offering to help for the previously discussed acquisitions. Snapshot of Trade: I am able to buy this low cost ETF commission free in my Vanguard brokerage account. 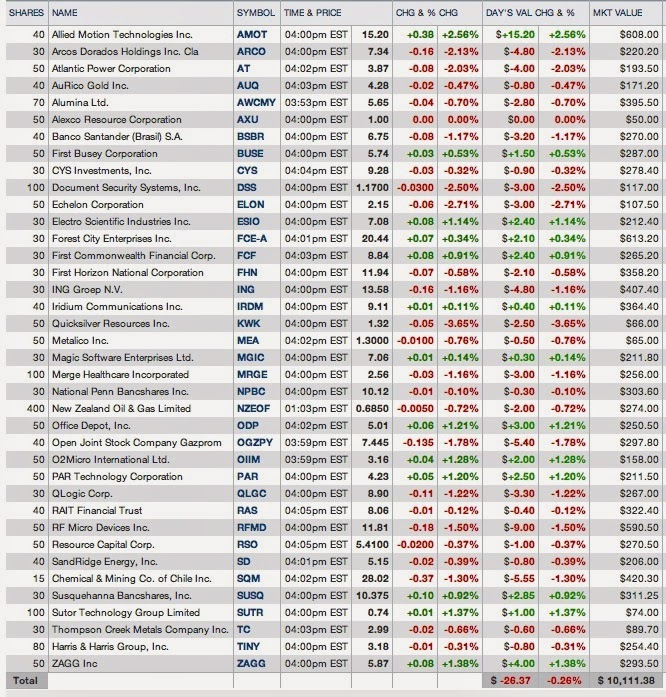 I will not be discussing most of these small ETF adds. I now own 20 VEA and future buys will be in the 5 to 20 share range and will probably not be mentioned here. European equities have become unpopular again. I would note that most of the top European holdings are multinationals. The exposure to Europe explains the poor performance from 2006 to present. Since I have no idea when Europe will start to meaningfully contribute to worldwide growth, I will be adding only small lots, spaced out in time. Eventually, European equities will play catch up with the U.S. My exposure to this stock asset class (foreign stocks ex-Canada) is really light now. I am substantially underweighted in Japanese and European equities. Through 8/15/14, the fund had a YTD return of just 1.5% and 11.78% over one year. The three year annualized total return was 10.63%. Vanguard FTSE Developed Markets ETF (VEA) Total Returns The relative underperformance to U.S. stocks is one reason for nibbling. Over the same periods, SPY was up 6.95% YTD, 19.95% over 1 year, and a 19.99% and 16.53% annualized total return over three years and five years respectively. SPDR S&P 500 (SPY) Total Returns The five year annualized return for SPY was 7.86% better than VEA. That is huge as an annual difference and really mounts up over a five year period. Future Buys: I will periodically add to this position in small lots. Generally, I will add a small lot to one of my commission free and low cost ETF positions whenever there is a 1% or greater daily decline, preferably when the purchase would lower my existing average cost per share. Security Description: Chambers Street Properties (CSG) is a self-administered and internally managed REIT that focuses on acquiring, owning and operating net-leased industrial and office properties. A net lease requires the tenant to pay rent and expenses normally paid by the property owner including real estate taxes, insurance, maintenance, repairs and/or utilities. A single net lease will require the tenant to pay property taxes. A double net lease adds insurance costs to the tenant's obligations. In the triple net lease, the tenant is responsible for all costs normally paid by the owner. The rent would of course be lower than in a standard lease agreement for the same property. Chambers owned or had a majority interest in 129 properties, including those owned in joint ventures, containing 35.9M rentable square feet (as of the day of my last purchase). Overview | Our Portfolio | Chambers Street Properties Those industrial and office properties are located in 20 states, Germany, the U.K. and France. Brad Thomas wrote an article about CSG that was published at Seeking Alpha (4/1/14). The occupancy rate (same store) was at 95.6% as of 6/30/14, down slightly from 95.8% as of 6/30/13. Rationale and Risks: The payout ratio is improving, as shown in the preceding snapshot. Dividends are paid monthly. I am reinvesting the dividends to buy more shares currently. The current valuation is reasonable at P/FFO of 11.55 based on the 2014 estimate of $.68 and assuming a price of $7.86. 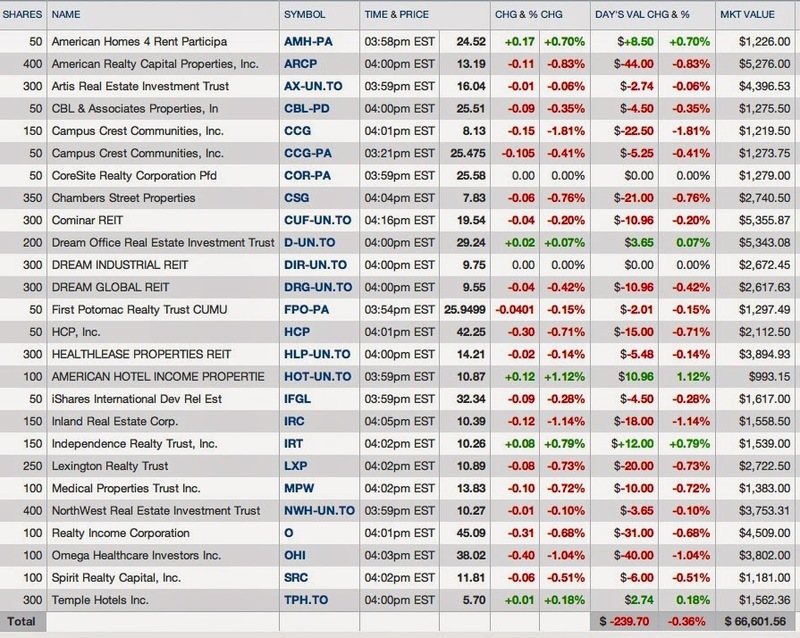 REITs generally have unimpressive dividend growth and will frequently cut their dividends during recessions. I would not expect much dividend growth from Chambers. The current rate has been constant since the October 2013 distribution. FFO is estimated to be minuscule between 2014 at $.68 to $.7 in 2015 or just 2.94%. Perhaps the market is wrong given the current yield and valuation in today's abnormally low interest rate environment. Since 90%+ of the net income has to be paid out in dividends, cash is not being retained to grow the business. Share issuances are used to raise new capital. Chambers has a number of short term mortgages on their properties. While the current rates are low, commercial mortgages are relatively short in duration and will need to be refinanced continually. Income generation can be hurt by higher refinancing costs. What goes around, comes around. While near term debt is likely to be refinanced at lower rates, the already refinanced mortgages may easily have to be refinanced at higher rates when they mature. At some point, it might be wise to de-emphasize that kind of lending in exchange for longer term fixed coupon debt. Investors have a tendency to view REITs as bond substitutes. Consequently, the price will frequently be driven down when interest rates rise. Link to recent Seeking Alpha discussing recent developments and the last earnings report. Since my last discussion, ARCP closed its acquisition of "approximately" 500 Red Lobster restaurants in a sale-leaseback transaction. I thought the use of approximately in this context was somewhat humorous. Does it mean that ARCP does not know the precise number of restaurants that it purchased and leased-backed to Golden Gate Capital which acquired those stores from Darden Restaurants Inc. (DRI). ARCP asserts that the transaction was completed "at a cash cap rate of 7.9% and a GAAP cap rate of 9.9%". The weighted average lease of this portfolio is in excess of 24 years, with the master leases including "2% annual compounded contractual rent escalations". As I have noted in several comments at Seeking Alpha, I did not care for the large share issuance at $12 which occurred shortly after I bought a 300 share lot at $12.74. The President had asserted unequivocally in February 2014 that such a large issuance at that price would not happen. Recent Earnings Report: I thought that this report justified a repurchase of the 100 shares previously sold in an IRA account. For the 2014 second quarter, American Realty Capital Properties reported AFFO per share of $205.3M or $.24 per share and established a "pro forma" AFFO run rate at year-end of "$1.18-$1.2" per share. Portfolio occupancy was reported at 99.8% with a weighted average lease term of 12.2 years. The total number of properties was 4,429 occupying 99.1M square feet. Investment grade tenants, based on revenues, were at 46%. Rationale and Risks: Assuming ARCP hits its forecasted 2014 AFFO number, the valuation is reasonable. Dividends are paid monthly which is always a plus. Assuming a continuation of that rate, the dividend yield is about 7.76% at a total cost of $12.88 per share. I am still not going to get too enthusiastic about this stock. The then CEO Nicholas Schorsch told investors in February 2014 that ARCP would not sell stock at $12 (page 7 Earnings Call Transcript | Seeking Alpha: "We said we weren't going to see equity no matter what anybody said at $12") In May, ARCP sold 120M shares at $12. SEC Filed Press Release That creates a serious trust issue, at least for me. JMP Securities gave several reasons for downgrading ARCP back in May 2014 including his dismissal from American Financial Realty Trust in 2006. I explored that history in detail before that Forbes article was published in my SA comments. I am naturally weary of real estate wheeler dealers. Forbes ran a negative article about Schorsch last June, going into his past history. A scathing letter was sent to ARCP by the hedge fund Marcato Capital Management back in June, and I agreed with many of their criticisms. Future Buys/Sells: I will not buy more ARCP. My next trade would likely be a 100 or 200 share pare of the 300 share position held in a taxable account. The yield information is incorrect. This security had its IPO during the quarter and the dividend rate of $.3726 is the rate for a partial quarter. The entire quarterly rate will be $.453125 per share ($25 x. .0725=$1.8125 annually per share dividend by 4 quarters=$.453125 per share). Security Description: The AmTrust Financial Services 7.25% Non-Cumulative Preferred Series B Stock (AFSI.PB) is an equity preferred stock that pays qualified and non-cumulative quarterly dividends at the fixed coupon rate of 7.25% per annum on a $25 par value. The prospectus contains a typical "stopper" clause that is the legal means for enforcing the preferred shares preference right to income compare to "junior" securities which means common stock in this case. The issuer has the option to call at par plus accrued dividends on or after 7/1/19. The issuer is the controversial AmTrust Financial Services (AFSI) who has been criticized and questioned about its accounting practices. Several of those articles were written by The GeoTeam who has a long position in AFSI puts. Barron's has also published a negative article. This security is not rated. Link to Zacks.com discussion of this earnings report. Rationale: The only reason to invest in this security is to generate income. This preferred stock pays qualified and non-cumulative dividends. At a total cost of $24.79 per share, the dividend yield is about 7.31%. This security went ex dividend on 8/27/14 after my purchase. Risks: The company discusses risks incident to its operations starting at page 38 of its 2013 Annual Report: AFSI 12.31.2013 10K I do not have the training or the background to render any opinion about the merit of the accounting issues raised by The GeoTeam. As a general rule of thumb, I will buy an equity preferred stock issued by a leveraged financial institution knowing that the security would likely become worthless in a BK, just like the common stock. Future Buys/Sells: I will need an 8% yield to average down. I will consider making that purchase in an IRA account for its income generation. Given the accounting issues raised by others, I will not be adding more than another 50 shares. A more likely outcome is that I will simply flip this 50 share lot after collecting one or more dividends, shooting for a total return of 8% to 10%. The total interest paid was $634.41 resulting in a total return of just +$233.48. Related Trades: I have successfully trades a Sears Acceptance secured bond maturing in 2018, but will stay away from that one going forward. SOLD 3 Sears 6.625% Senior Secured Bonds Maturing in 2018 at 95.002-ADDED 2 Sears Holding Senior Secured 6.625% Bonds Maturing 10/15/2018 at $89.75; Bought 1 Sears Holding 6.625% Senior Secured Bond Maturing 10/15/2018 at 83.25 That bond is currently rated B- by both Moody's and S & P.
I do currently only one of the Sears 2018 secured bond, and would sell it when and if I see a buyer willing to take just one. Security Description: The MS Structured Asset Corp. SATURNS Sears Roebuck Acceptance Corp. Deb Bkd Series 2003-2 Cl A-1 (SSRAP) is an Exchange Traded Bond in the Trust Certificate legal form of ownership. The underlying bond is an unsecured senior Sears bond maturing in 2032. When I sold this security, the underlying bond was rated Caa2 by Moody's according to FINRA. Rationale: I gave up on Sears surviving to pay off this note. In addition, I have already booked a lot of gains this year, and this loss will reduce my tax bit some. There was one deletion since the last update. There were several additions discussed below. Iridium Communications almost made the cut for a snapshot at +29.8%. I previously bought this stock as part of the LT basket strategy: Sold LT Basket: 30 QLGC at $11.7 (8/26/13 Post)-Bought 30 QLGC at $8.83. QLGC was one of many Nasdaq bubble stocks in the 1999-2000 period, as I noted when I first purchased 30 shares as an LT. Asinine does not describe the insanity when the stock price hit a 290 P/E. QLGC Interactive Chart The share price went from $2 in 1998 to $78 in February 2000, adjusted for four 2 for 1 stock splits, and then quickly turned on a dime and plunged to $11 by March 2001. Since the investors sobered up, the stock has been moving mostly in a $10 to $20 range since 2001. On the day of my purchase, QLGC fell some after being downgraded by Barclays to equal weight from overweight, with the target price reduced to $13 from $10. TheStreet This downgrade occurred after the stock had already experienced a sharp decline from $12.97 in early April 2014: QLGC Interactive Chart At the time of my purchase, the shares were trading below the 50 and 200 day SMA lines, which is standard for LT selections. I am focusing on falling knives, as noted above, and the chart will almost never say buy me. B. Bought 40 Gazprom at $7.065 (see Disclaimer): I bought the ADS shares traded on the pink sheet exchange. Gazprom OAO (OGZPY). As a reminder, I will not go to a Russian website to read an earnings report, so I have not actually read Gazprom's recently release second quarter report. Gazprom is a major oil and natural gas producer. It operates Russian's Unified Gas System. Gazprom has been in the news lately in its collection dispute with the Ukraine. A story in Bloomberg noted that the brokerage firm VTB predicts Gazprom may cut its dividend by up to 44% due to that collection problem. First half profits declined 38% to $4.3B or RUB155B. Assuming some satisfactory outcome for the current crisis involving Russia and the Ukraine, which is questionable, the major long term problem with Gazprom is its home country, a lawless state run according to the whims of a former KGB colonel. If Russia had an independent judiciary and a free press, which is not the case now or for the foreseeable future, Gazprom's stock would probably be priced four or five times higher than its current quote. There are multiple reasons for classifying this purchase as a Lotto. Bloomberg calculates the P/E based on estimated 2014 earnings at 2.65, based on the 8/14/14 close of USD$7.27. That number might not be updated with Gazprom's second quarter results. The estimated P.E.G. ratio was then .7383. The indicated dividend yield at that price was 5.47% with the ex-dividend occurring on 7/15/14. The dividend is paid annually. As mentioned above, I would reasonably anticipate a significant dividend reduction next year. New Zealand Oil and Gas Ltd (NZO.NZ) Key Developments Page at Reuters. Company Website: New Zealand Oil & Gas. The company is paying a dividend, but the amount is erratic. Two semi-annual payments of NZ3cents per share were made in 2013. One NZ three cent per share payment was made earlier in 2014. New Zealand Oil & Gas dividends Assuming a continuation of an annual NZ 6 cents per share, and the same conversion rate prevailing on 8/14 (of course it fluctuates), then the dividend yield with those assumptions before the NZ withholding tax would be about 7.14% at a total cost of USD$.7. This purchase was based primarily on the information contained in this Seeking Alpha article. I left a comment. As noted in that discussion, RAS had a near death experience during the Near Depression period, as reflected in the stock price chart. Adjusted for a 1 for 3 split, the share price went from a 2007 high near $103 to $2.5 in February 2009. RAS Interactive Chart A picture can be worth a book of words. When I see that kind of action, I will characterize any purchase as a Lotto only. While admittedly $44.09 does not sound like much now, it does represent an 18.5% return on my investment in about 4 months. I also received a paltry dividend. RB, who runs the LT strategy, does not need a reason to buy or to sell. To the extent that it might have had a reason, it may have had something to do with the latest developments in the Ukraine. NATO claimed that Russia moved its artillery units into Ukraine. NYT I was glad to see those trucks return to Russia. And, maybe Merkel can sweet Vlad into being nice for a change. I have included in the table a 100 share purchase of ARCP which has not yet been discussed. While it is too early to tell, I thought that it was noteworthy that VNQ declined by .8% last Friday as TLT rose .56%. 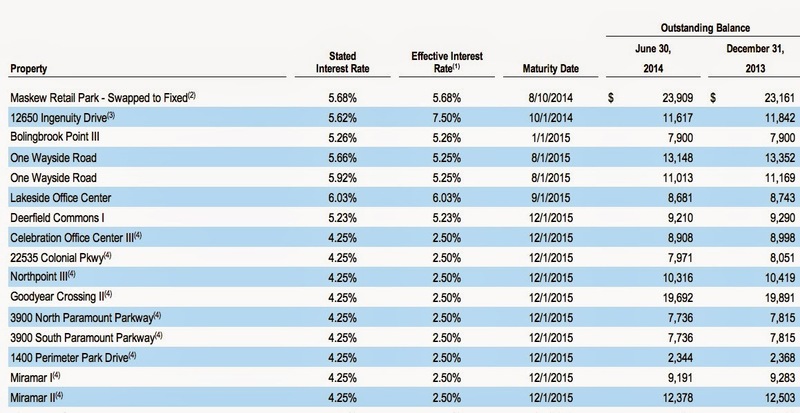 Regional bank stocks are in a funk this year as interest rates started to go back down. One of the regional bank ETFs, KRE, closed at $40.61 on 12/31/13 and at $38.97 last Friday, but has closed as low as $36.84 this year (2/3/14). SPDR S&P Regional Banking ETF ETF Chart That ETF had worked its way back over its 50 and 200 SMA lines when I published the last update but has since fallen below those lines again. The KRE price is very close to its 50, 100 and 200 day SMA lines which have converged. Without some negative event next week, I would anticipate a crossover to the upside for all of those lines. A. Bridge Bancorp (BDGE): Bridge Bancorp reported core net income, which excludes securities gains and acquisition related expenses, of $4.5M or $.39 per share. The coverage ratio of 716.8% is comforting. After selling my higher cost shares profitably, I currently own 109+ shares at an average cost of $19.05 per share (see snapshot at Item # 4 Pared BDGE Selling Highest Cost 56 Shares at $24.71) I have quit reinvesting the dividend, even though I can acquire shares at a 5% discount through a dividend reinvestment program. Item # 1 BOUGHT 50 BDGE AT $18 (October 2011); Item # 4 Bought Back 50 BDGE at $19.65 (August 2012). 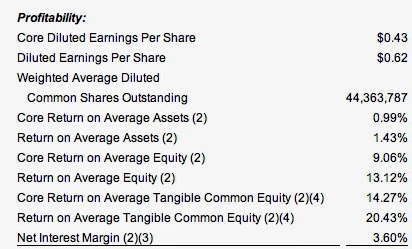 Some of the small fractional dividends resulting from pairing the overall position. B. NBT Bancorp (NBTB): NBT Bancorp reported second quarter core net income of $19.1M or $.43 per share, better than the consensus estimate of $.41. Core net income excludes the $11.2M net gain resulting from NBTB's sale of its ownership interest in Springstone, LLC and $2.9M in prepayment penalties associated with long term debt refinancing which is a positive longer term. At that price, and assuming the consensus estimate for 2015 is spot on, the forward P/E is about 13.37. C. United Bankshares (UBSI): United Bankshares reported second quarter net income of $33.2M or $.48 per share, up from $.44 in the 2013 second quarter. At the current $.32 quarterly dividend rate, the yield is about 7.73% at a total cost of $16.56 per share and growing. D. Bar Harbor Bankshares (BHB): Bar Harbor Bankshares reported net income of $3.9M for the second quarter or $.65 per share, up from $.54 in the year ago quarter. The estimate, generated by just one analyst, was for $.57. The capital ratios are good. E. Added 25 BHB at $26.34 (see Disclaimer): This was an average up. After receiving 25 shares in a stock split, I decided to round up to a 100 share lot. The numbers for the second quarter were good. The quarterly dividend rate is currently $.223 per share, up from $.1733 per share in 2009. NYSE Assuming a total cost per share of $26.34, and a continuation of that rate, the dividend yield would be about 3.39%. Bar Harbor Bankshares (BHB) is a bank holding company that owns the Bar Harbor Bank & Trust which has 15 branches on or near Maine's coast. 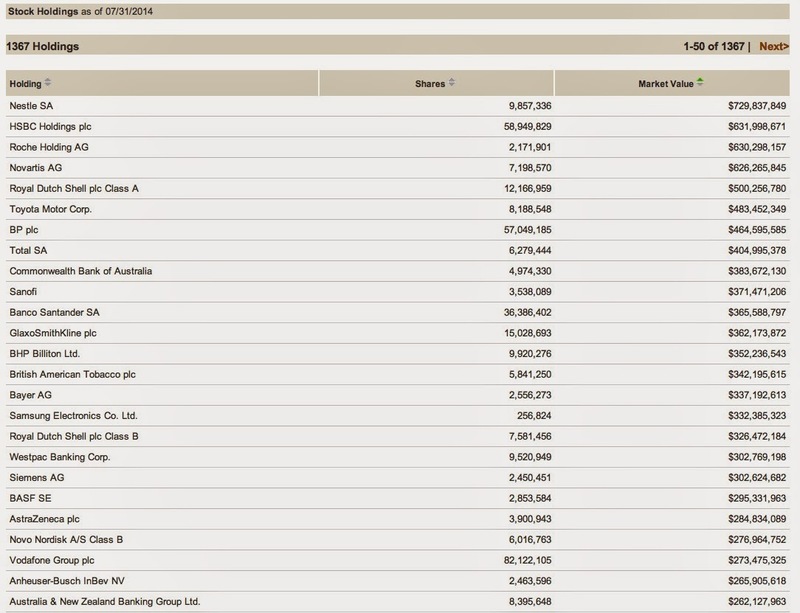 BHB is a small bank and there is frequently a large bid/ask spread. 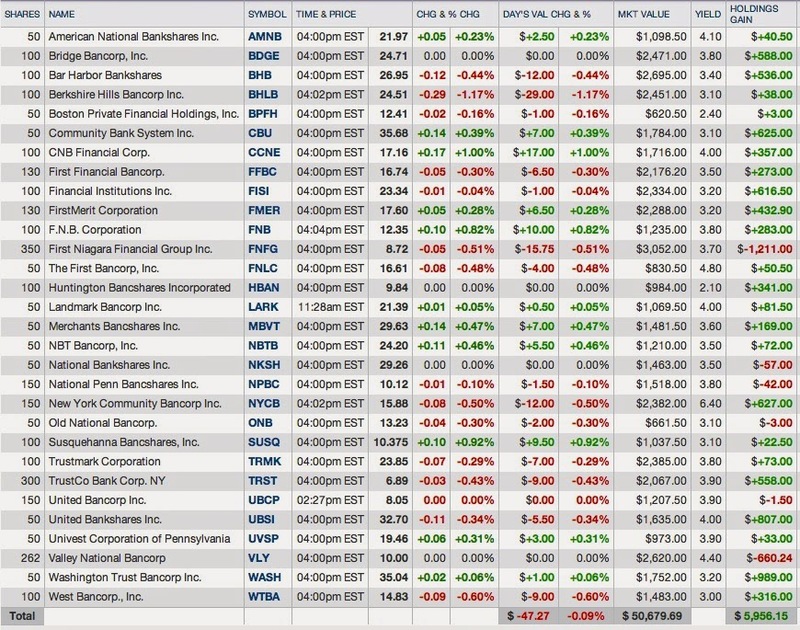 On the day of my purchase (8/4/14), the shares traded in a $26.02 to $27 range and closed at $26.59, down $.1 for the day. My purchase at $26.34 or $.35 per share below the prior close or just enough of a downdraft to compensate me for the $7.95 commission on that 25 share odd lot. The last ex dividend date was on 8/13/14. I am not reinvesting the dividend. 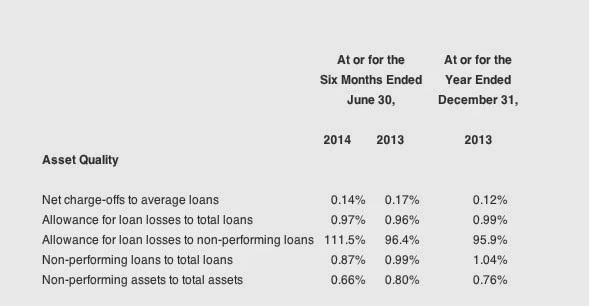 Any NPL ratio below 2% during that period would be excellent in my opinion. And, the dividend was raised every year during 2007-2010. While the dividend yield is good, I was not pleased with the last earnings report: SEC Filed Press Release E.P.S. for the 2014 second quarter was $.33, down from $.4 in the 2013 second quarter. NPAs grew to 1.44% from .8%. United Bancorp Inc. (UBCP) is a bank holding company with a market capitalization of around $39M at the $8.08 per share price. Generally, the bid/ask spread is large and trading is sparse. On the day of my purchase, the spread shrank to $8.04B/$8.08A when I placed my order so I just entered a limit order to buy 50 at the ask price. My 50 share lot was part of the 1,841 share total. UBCP operates through The Citizens Bank and The Community Bank with 20 branches in Ohio. The low ROA and ROE will keep my investment in this bank low and I will trade the position some. I previously sold a 50 share lot for a small profit. Sold 50 UBCP at $10.05-Bought 50 UBCP at $8.49 With this last 50 share lot purchase, I have bought back those shares at almost 20% below my last sale's price. The current quarterly dividend is $.08 per share, which was recently raised from $.07. United Bancorp, Inc. (UBCP) Dividend Date & History; United Bancorp, Inc. Declares its Third Quarter Regular Cash Dividend Payment Assuming a continuation of the $.32 annual penny rate, the dividend yield is about 3.96%.